Posted on February 9, 2011 at 4:55 am. I told you in an earlier post that I’d tell you about mind mapping. 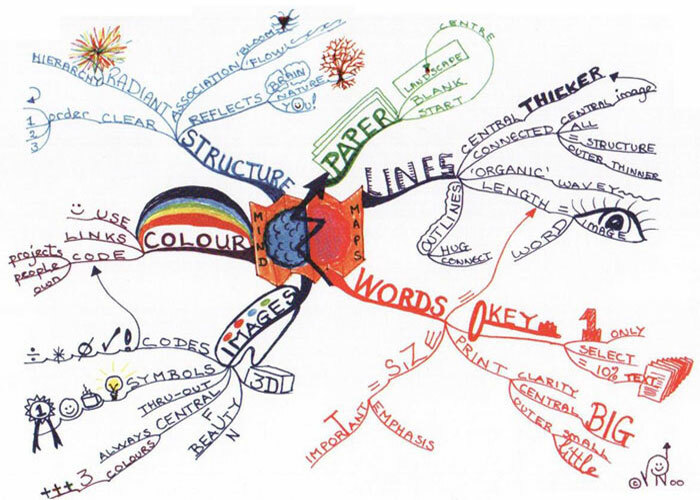 A mind map is a diagram that starts with a central word or concept, then spreads out to show how you visualize other words or concepts (or project tasks or images or anything else) connected to that. Mind maps are inherently non-linear, with the focus of the mind map in the center of the page and then everything connected to it moving out from there. As you can see, thought, the things that make mind maps most effective are to use lots of color and lots of illustrations. You not only have words and key concepts to hang your memories on, but the color and graphics make them easier to remember and make the concepts and relationships stand out. The right side of your brain thinks in pictures and colors far more than in words, so this technique gets both sides of your brain involved, increasing the depth of the associations on a subject. In addition, you should put your thoughts down without trying to squeeze them into place in an arbitrary linear hierarchy. Mind mapping is a technique for getting your thoughts down on paper on a subject while recognizing that many concepts are not inherently linear. There are certainly many concepts that are dependent on other concepts, things that are linear and stepwise, but you don’t have to make things fit an outline that moves chronologically from A to Z just because. In fact, if you think about it, outlining is most relevant for books or printed manuals… but if you’re creating an online help system or a web page or something else with hyperlinking and non-linear navigation, outlining presents a false structure. Mind maps are far more radial in their symmetry, frequently without a specific starting point from the central concept. The colors and graphics may give some clues, but it’s also possible that one starting point is as good as any other. Because the purpose of the mind map is to use visual and graphic elements to highlight relationships, the first two examples give a lot of information through the weight of the graphics. Tony Buzan invented contemporary mind mapping. While there have been many pictorial record systems going back at least 2300 years, Buzan has popularized mind mapping in several books, such as Use Both Sides of Your Brain and The Mind Map Book. His techniques have also expanded on the connections between left and right brain activity and rung in software as well, for all of which is he richly deserving of credit. Information about Freeplane, another good mind mapping product (and a download link for Freeplane as well). Mind mapping isn’t the tool you’ll want to use for everything, but it’s a great thing to know for breaking the bonds of a heirarchical outline. In fact, I will frequently mind map something first and then, with the concepts and relationships down on paper, I can start assigning weight, order, and presentation methodology in a linear outline. Try it out on some small piece of writing, such as an article or a blog post and see how it works for you. Final tip: if you’re sweating too much over what goes where on the page, you’re putting too much thought into it. Mind mapping should be as light and quick as possible. Mind maps are usually a lot more fun than an outline because your right brain gets a chance to participate. If your pen is hovering over a section of the page too much, you’re probably stuck on something, so go do something else in another part of the mind map until whatever you’re trying to place pops up again. Posted on August 19, 2010 at 8:51 am. I’d like to recommend WHY Magazine. WHY is an acronym for Work.Home.You and, as you might guess, it’s aimed at home workers. It’s pretty interesting. If you’re a home worker of any kind, take a look. Posted on July 20, 2010 at 8:40 am. There’s a website that I’ve signed up on, called SpeakerSite.com. It’s aimed at professional speakers of all stripes. It’s very interesting. I’m enjoying being outside my normal venue. I’d really like to try my hand at more speaking, particularly more well-paid speaking. I run the SIG within the site for authors, which is the most popular SIG on the whole site. Well, well, well, I tapped into something there! If you’re interested in hanging out online with speakers and people interested in speaking, sign up. Feel free to ping connect with me when you get there. Posted on July 13, 2010 at 9:48 am. Posted on July 8, 2010 at 8:13 am. Baseline Briefing ran an article by Ericka Chickowski on 7 ways to ruin a PowerPoint presentation, who said “PowerPoint is not inherently evil, but it sure feels that way when you are trapped in the audience for a bad presentation.” There was nothing much new in it, but they did have a link to Peter Norvig’s excellent piece, “the Gettysburg PowerPoint Presentation,” a good demonstration of how not to do PowerPoints. Posted on July 3, 2010 at 10:57 pm. Better than English is a fun site that collects non-English words that are of great use for describing a concept. If you have an example of a non-English word that sums up a concept, feel free to submit it. Posted on July 2, 2010 at 1:37 pm. Wordle.com is a juicy little nugget for the literarily inclined. Wordle generates word clouds from text that you provide it by analyzing the frequency of words in the text and then assigning a greater prominence to the words that appear more frequently. You can then change the cloud by changing the colors, fonts, and layouts. It’s really quite fun! Feed Wordle the text of your latest article, or a manual draft, or that novel you’ve been working on. Or go to, say, Project Gutenberg, and grab something and try that out. It’s a great time-waster, as if I had time to waste these days. Posted on July 2, 2010 at 12:24 pm. Tom Johnson is the guy who told me about WordPress. All about WordPress: I took a great seminar from him at this year’s STC conference in Dallas and it was what triggered me to move forward on setting up a professional blog. He’s got a great website for writers and technical communicators, called I’d Rather Be Writing. If you’re reading this blog, you’ll likely enjoy Tom’s blog, too. Posted on July 2, 2010 at 12:19 pm. This is a map of the wheel-ruts of modern English. Etymologies are not definitions; they’re explanations of what our words meant and how they sounded 600 or 2,000 years ago.